Masonite Steel & Fiberglass Entry Systems Give You More. Enhance your curb appeal and add value to your home with a Masonite entryway. Homeowners, architects and builders rely on Masonite for a comprehensive line of beautiful and durable ﬁberglass and steel entry doors. Featuring our extensive line of ﬁberglass and steel door products available in a range of panel designs and glass conﬁgurations that are sure to meet your architectural style or design need. Make your entryway come to life when you experience our door designer at www.masonite.com. Choose a Masonite entry door design to suit your taste and complement your home’s architectural style. Select from our vast line of traditional, contemporary or modern designs – from 1 panel to 9 panel patterns with or without decorative glass elements. Get creative and design your own custom look by enhancing your door with beautiful matching glass, transoms and sidelites. 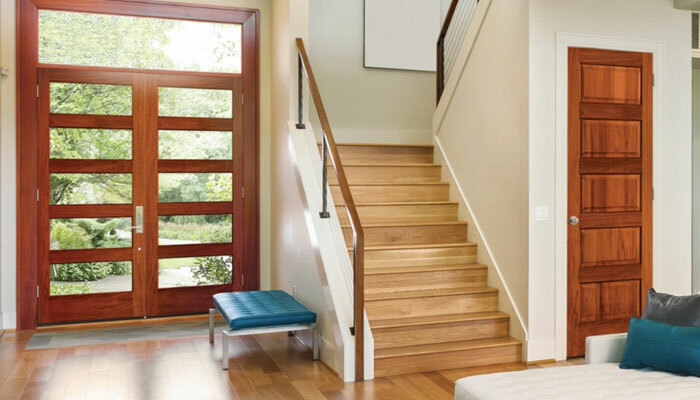 Selecting the right door can bring years of enjoyment and hassle-free maintenance that will leave a lasting impression. Masonite Textured Fiberglass doors display exceptional, deep wood-grain detail, adding richness and signiﬁcance to your home’s exterior. Our smooth ﬁberglass doors are perfectly engineered for durability and longevity, plus they’re easy-to-paint for a custom look. Masonite Steel doors offer security and protection for your peace of mind. Whole-home solutions: No one matches our comprehensive selection of both exterior and interior choices, giving you access to the styles, finishes and details to tailor a complementary look that flows seamlessly from room to room. Authentic architectural styles: Our designs are inspired by true millwork craftsmanship. Exacting proportions, architectural details and engineering ensure the ultimate in aesthetics and performance. Innovation: We strive to continually improve door performance by engaging in full-scale R&D to discover new technologies and materials that lead to next-generation products. Quality: Masonite doors are made better from the start, with complete supply chain control and higher quality components than similarly priced products. We ensure everything that carries the Masonite name lives up to our exacting standards for quality, consistency and craftsmanship – all backed by industry-leading warranties. Confidence: All Masonite products go through an extensive testing and certification process for durability, wear, impact-resistance and overall performance, ensuring you get a quality product every time.